The government report below says that chemicals in conventionally-grown food are a problem and we should choose organic foods. Yet the government also says that chemicals in conventionally-grown food aren't a problem (USDA Pesticide Data Program: "The 2010 PDP report confirms that food does not pose a safety concern based upon pesticide residues."). Indeed, the 2010 Dietary Guidelines, which is published jointly by the USDA and the Department of Health and Human Services (the same DHHS which published the report below), makes no mention of pesticides in food. "Exposure to pesticides can be decreased by choosing, to the extent possible, food grown without pesticides or chemical fertilizers and washing conventionally grown produce to remove residues. Similarly, exposure to antibiotics, growth hormones, and toxic run-off from livestock feed lots can be minimized by eating free-range meat raised without these medications if it is available. Avoiding or minimizing consumption of processed, charred, and well-done meats will reduce exposure to carcinogenic heterocyclic amines and polyaromatic hydrocarbons." "In general, adequate infrastructure exists at the Federal level to perform necessary regulatory functions related to the manufacture, use, disposal, and exposure limits of known or suspected environmental carcinogens. However, key agencies are not fulfilling their responsibilities to protect public health. U.S. regulation of environmental contaminants is rendered ineffective by five major problems: (1) inadequate funding and insufficient staffing, (2) fragmented and overlapping authorities coupled with uneven and decentralized enforcement, (3) excessive regulatory complexity, (4) weak laws and regulations, and (5) undue industry influence." So, the President's Cancer Panel is unabashedly advising Americans to eat organically-grown foods to reduce exposure to cancer-causing chemicals, yet the EPA, FDA, USDA, etc., are choosing not to regulate the presence of those chemicals in our food. How do we know if the EPA's limits on pesticides in food, referenced in this recent Stanford Review of organic food, is worthy if the government itself admits that research is inadequate, industry influence is pervasive, and funds to investigate the problem at all are lacking? "The American people — even before they are born — are bombarded continually with myriad combinations of these dangerous exposures. The Panel urges you most strongly to use the power of your office to remove the carcinogens and other toxins from our food, water, and air that needlessly increase health care costs, cripple our Nation’s productivity, and devastate American lives." Have to say, I was surprised to find a government document that advises individuals to eat organic. I would stop short of that advice because I recognize there are many who can't eat organic... people in institutions like hospitals, nursing homes, senior centers, schools and universities, work cafeterias, and of course those for whom access is denied. In the public health field "access" covers many bases - financial, geographical, social, logistical. This isn't an issue of individual choice (a point the document makes as well), it's an issue of access. We should be making pesticide-free food the default for everyone, not just a choice for the privileged few. The language of that bullet comes across as less scholarly and more activist driven; regurgitation pro-organic propaganda without much weight to back the claims. What food on the market is grown without pesticides? Organic uses pesticides, it doesn’t mean pesticide free. Or are we just talking about synthetic pesticides? I suppose organic can be free of all pesticides, but so can conventional, there’s no requirement to use pesticides in either, but most prudent farmers will to guarantee yield and cosmetic appearance. Why shouldn’t we wash away organic pesticides as well as conventional? Really, it probably depends on the specific pesticide use. A synthetic pesticide that is demonstrated to have a very low health risk is probably fine, (even leaving high residue), compared to a natural pesticide that has a higher associated health risk (even in lower residue concentration). For conventional pesticide that’s been discontinued for health risk concerns we have DDT (banned 1972), but for organic pesticide that’s been discontinued for health risk concerns we have Rotenone (banned 2005). Also, in that sentence, if avoiding pesticides is the goal, what does chemical fertilizer have to do with that? Is it contaminating food? Is it causing toxic run-off? Is it really even a concern? Or is it conflating aspects of conventional and unduly lumping them together as a problem. If chemical fertilizer problem, it needs to be explained as to why, not laundry-listed without explanation. The photo could just as easily be organic pesticide aerial application. 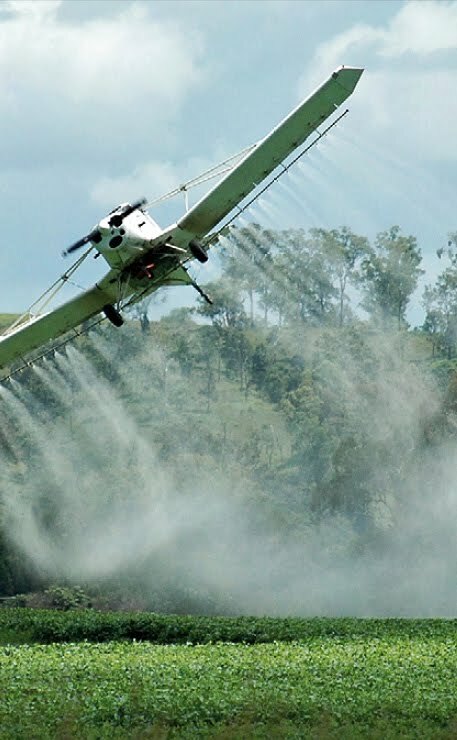 Yeah, as pilots they would say that aerial application should be a daily affair (“Hire us!”) but still, I think we can take their word for it that there isn’t some sort of organic pesticide aerial application ban. If not by plane, organic pesticide is applied by hand held sprayers. When govt. funding for science is cut, corporate money rushes in to fill the void. Given the choice, I'd go w/ the organic option, erring on the side of caution, if nothing else. It's "caveat emptor" from here on in. I think we could do more to advance the health of the nation by concentrating on public health measures ... food safety regulations, truth in advertising (and transparency), and broader issues like education, instead of employing a "buyer beware" model.